The Meteorology department at Reading is internationally renowned for its research. This research includes hundreds of theses for which we regularly receive requests for copies. As the department’s librarian, I wanted to digitise our collection of theses to preserve them and make them more accessible to researchers within and outside of the University. After looking at a number of options, we decided to do this through the British Library’s Ethos service. Ethos is the UK’s national thesis service and makes theses available for free to researchers worldwide. One of the key advantages of Ethos is that it is able to deal with copyright issues with their electronic copyright declaration form. Therefore, in May I boxed up our department’s PhD theses and sent them off to the British Library to be scanned and added to their Ethos service. We already had some PDFs of Meteorology theses on our catalogue, so we sent these off to the Ethos team as well. It has been an exciting project to work on and a first within the UK: we were the first department that the British Library has worked with to digitise an entire thesis collection. Considering that none of those involved had done this before, it went surprisingly smoothly. The digitisation of the entire collection was finished well within the time frame we set: the department’s 50th anniversary over the summer. All the department’s 388 PhD theses are now available, both on the shelves and on Ethos in time for the new academic year. The department thesis collection had a very slow start. The collection goes back to 1970, with just 4 theses in that year. By 2014 the number of theses added in the year had reached 14. 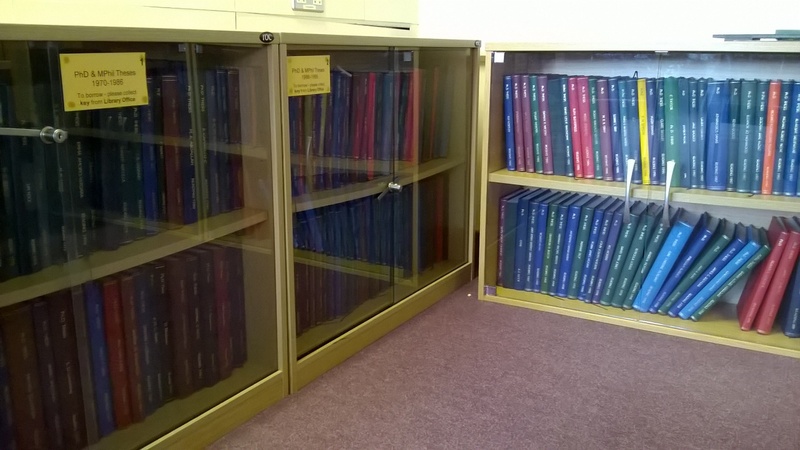 In the 1970s 30 theses were added to our collection compared with 126 theses in the first decade of the 2000s. Our first female PhD student to publish her thesis was Emma Amores-Vergara in 1976 – the only female student to publish her thesis in the whole decade. In comparison, in the 2000s, 34 female students added their theses to the department collection and so far in the 2010s 29 out of our 70 theses are from female students (41%). Since it is now a requirement that all theses are submitted in an electronic format, this was a one-off exercise. In future the British Library will harvest our theses from Centaur (the University’s repository) and therefore the Meteorology department’s entire collection will always be available on Ethos. This entry was posted in Academia, Teaching & Learning, University of Reading, Weather and tagged PhD theses collection;. Bookmark the permalink.